The movie begins at a fast pace with the Enterprise rushing to save the primitive inhabitants of a distant planet from a massive volcano. The entertaining start of the movie with an alien planet sequence, including a chase through imaginative flora and the tension of Spock (Zachary Quinto) almost dying, was yet another fun homage to the slightly kitschy planet trips from the series. In the process of saving the planet and Spock, Kirk (Chris Pine) violates Prime Directive and lands himself a demotion to Admiral Pike’s (Bruce Greenwood) first mate and a reassignment for Spock to another ship. As part of their new positions, Spock and Kirk are included in a high level meeting after an attack is made on the Star Fleet archives in London, and when the meeting comes under attack and Admiral Pike is killed, Kirk is bent on avenging his mentor. Admiral Marcus (Peter Weller) agrees to send Kirk and the Enterprise, armed with experimental torpedoes to Qo’noS, the Klingon planet, to chase down and kill the rogue agent responsible for the attacks. In his drive to pursue the fugitive, Kirk runs into questions from many in the crew and a warning from Scotty about the torpedoes that leads to Scotty’s resignation. In warp the crew loses power in the ship’s core, then endures a close encounter with Klingons (not long enough on the screen, but it’s a promise of more to come), and has the fugitive surprisingly surrender. It becomes apparent that this mission is not as straightforward as it seemed. Through Kirk’s willingness to open dialogue with the rogue agent, Spock’s curiosity about a new, surprise science officer on the ship (Alice Eve), and the arrival of Admiral Marcus in a new and unknown Star Fleet ship, it is apparent that the admiral is attempting to start a war with the Klingons while also covering up activity that was not approved by Star Fleet. The Enterprise crew, in the middle of hostile territory with a growing number of enemies and suffering major damage, has to fight to save the entire crew and the future of Star Fleet. The story of Into Darkness is the final strengthening of the relationship among the Enterprise’s crew. It’s the challenge that cements their characters, their moral resolve, and their reliance upon one another. The actors that make up the cast continue to have fantastic chemistry and understanding of their characters going back to the original series. Action definitely helps move the story along, but it doesn’t take away from the characters, the story, or the discussion of morality and scientific innovations that drive the Star Trek franchise. Throughout, we learn more about Spock’s feelings for Uhura (Zoe Saldana) and enjoy the growth of their relationship. Chris Pine’s Kirk is gutsy as ever, but Abrams now includes a little more of the self-doubt and fear that lurks beneath the surface anyone so brash. Bones (Karl Urban) and Scotty (Simon Pegg) utter many of their well-known one liners and quips, but they work them into their versions of the characters and have a great ability of hamming it up when they can but being serious in their overall delivery. Even with these performances by the Enterprise crew we have already begun to love, Benedict Cumberbatch’s cold and villainous turn as the most dangerous adversary of Kirk and crew, Kahn, is utterly enjoyable. In the BBC series Sherlock he plays a brilliant sociopath who uses his powers kinda for good but mainly because he likes the challenge of the mysteries. As Kahn, Cumberbatch channels some of this character, but it is colder, quieter, and wholly sinister in his intent to destroy the Enterprise and Star Fleet. He is also more physical and brutal than he has been in previous roles. Hate and vengeance flow heavily but smoothly from this Kahn…and we have the promise of more in the future. Light flares! We got them, but again they and the other imaginative effects added to the film make the ship and the other worlds more tactile and real. As a large ship crashed into San Francisco Bay (note to future San Franciscans in the 2250’s: do not live near Star Fleet Academy), you are likely to grab the arm of your seats. Viewing the film in IMAX 3D may not be necessary. There are really only a few 3D effects that really standout, but seeing it on a big screen of some kind is a must. That should not be a question for any Star Trek film. One issue some may have is the length/number of climaxes. Just when you think they’re getting to a place to tie it up, the catastrophe continues. It doesn’t make the film unbearably long though – just one of those moments when you’re thinking, “What else?” However, it’s just more time to watch Abrams continue to own the Star Trek legacy. If some were afraid that he wouldn’t be able to twice pull off the magic of honoring a well-loved series while also giving it a renewed aesthetic and tone, Into Darkness should relieve them. Now, can he pull off the hat trick? This entry was posted on Thursday, May 16th, 2013 at 5:09 pm	and is filed under Film, News. You can follow any responses to this entry through the RSS 2.0 feed. You can skip to the end and leave a response. Pinging is currently not allowed. 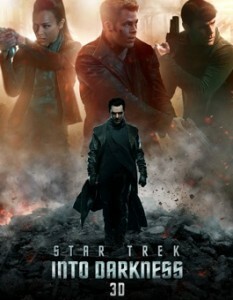 « Film Review: ‘Star Trek Into Darkness’!!! [wobbling significantly as he starts walking] I am not sure this floor is entirely stable.